On June 6th, 1944, Operation Overlord is launched. It's up to you to command audacious American and British paratroopers and glider troops in daring missions against stalwart defensive positions and fiendish counterattacks by the German Wehrmachet, SS and Fallschirmajagers, who are defending the Atlantic Wall of Hitler's fortress Europe. 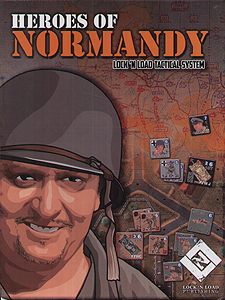 Heroes of Normandy is a complete game in the Lock 'n Load Tactical series. From the initial D-Day paratrooper drops, to the fighting in the Norman bocage, and on to Operation Market Garden, later in September, you can take charge of infantry squads and intrepid individuals, such as skilled Leaders and Heroes; aim at approaching tanks with bazookas, piats and panzerfausts; and find the range with heavy mortars and numerous anti-tank guns, from the American 57mm to the dreaded German 88mm. Vehicles, especially tanks, also clatter onto the battlefield to take on the infantry and, of course, each other M4A1 Stuarts, Fireflies and Cromwells square off against Panzer IIIs and IVs as well as the big cats: Panthers and Tigers. It's squad-level tactical combat at its most exciting!